Toronto Blue Jays pitchers and catchers reported to Dunedin this week, signalling the official beginning of spring training. The multitude of preseason stories being published about the Blue Jays are focusing on a somewhat common storyline. ‘This team has questions. BIG questions’! They talk about second base or the bullpen. They might discuss the starting rotation, and how it will line up. They’ll certainly discuss Toronto’s youth movement and how those players will fare in the face of a full Major League season. A lot of it will relate to who the Jays will take north with them, as is often the focus during Grapefruit League season. These things are definitely important questions to answer, and we’ll examine them here. But for me, the most important thing isn’t who ‘makes’ the team. Your team at the end of spring training is rarely your team at the end of September, or even at the end of May. The big pieces are already in place. Unless there’s a significant injury, the only real questions that matter are those of role. 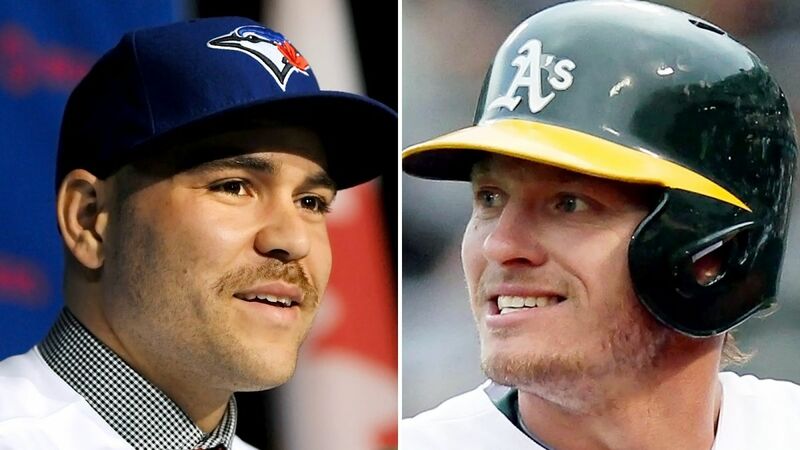 Roles can be a funny thing on a baseball team, especially in the American League. A strong starting nine needs be complemented by a team’s bench, which is generally constructed to help fill those roles properly.The designated hitter spot allows certain players to rest or to take a day off from the field, but you need to have the right piece to plug into their spot in the lineup. A lefty mashing bat, a defensive infielder, a strong backup catcher. These roles are important and can change greatly from team to team, be it offensively or defensively. This Blue Jays team has more specific needs than most, simply due to the personnel on the roster. Certain vital roles have, of course, already been filled. Offensively, the lead-off spot is anchored by Jose Reyes. The primary run producers might be the best in baseball, with Jose Bautista, Edwin Encarnacion and Josh Donaldson filling the middle of the order. Defensively, Toronto should be improved. Donaldson is an elite third baseman and Russell Martin is one of the best defensive catchers in the game. Combining their additions with a full season of Dalton Pompey in centre and Toronto should be better all around at catching the ball. On the mound, the top four starters are set and barring a late signing, so are the arms in the bullpen. What remains, as with the rest of the team, is the question of role. Who will be where once the season begins? Let’s take a look. The Jays made some big off-season acquisitions. Can it push them to the playoffs? I mentioned above that the big bats in the lineup are set. The biggest question for this lineup is as to who will become the secondary producers on days when those bats aren’t all going, or are out of the lineup. Russell Martin is certainly a key to this. He sported a .402 OBP last season, which has many thinking he’d be an ideal fit behind Reyes in the two-hole. He makes great contact and runs well for a catcher, so the reasoning seems to make a bit of sense. However, that OBP was a career high for Martin and came in just 111 games. Count on some regression to the mean; his career OBP is .354. Obviously Edwin will be playing every day, whether it’s at first base or designated hitter. How the breakdown works is the question now. The Jays want to keep Navarro’s bat in the lineup more than just once every five days, so he will be eating some designated hitter at-bats, at least until he’s traded. So how does Smoak fit in? I guess he’s a backup first baseman/DH? If Navarro hits consistently in the DH spot (he’s a switch hitter) the former first round pick might be relegated to pinch hit at-bats and the occasional off day fill in. With Navarro awaiting a trade however, it’s easy to see why Toronto will hang on to a player who was once a top prospect, hit 20 home runs in 2013, and is also a switch hitter. Steamer expects 16 homers and a .730 OPS out of him in a part time role (105 games) this season. I’ll be honest: I’d take that! Especially if most of it comes after Navarro is moved out. Navarro’s fluid situation is the biggest variable for Toronto right now. 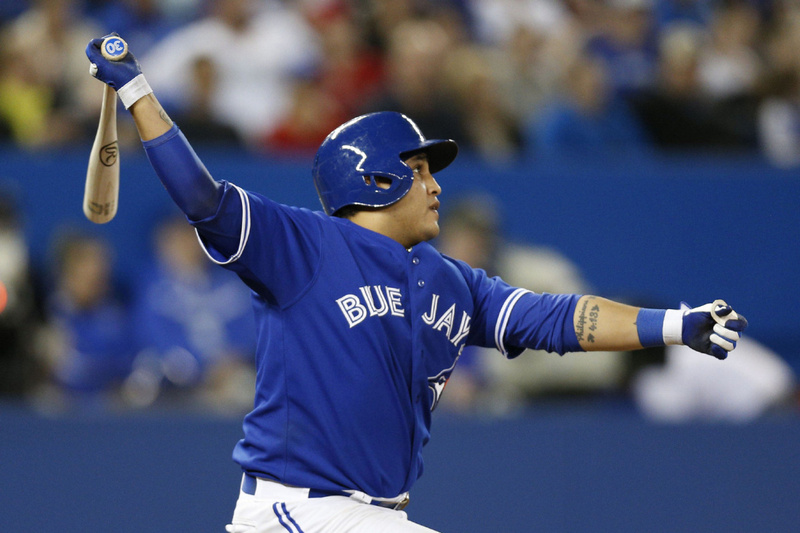 Will both players have to fill the back-up catcher role for Toronto? Gibbons and Anthopoulos have already expressed that they’d prefer this not to be the case, to say nothing of Navarro himself. But this question completely depends on a third player: Russell Martin. If Martin is able to consistently handle Dickey’s knuckleball, as is the hope, Thole will be bound for Triple A Buffalo. If he can’t, then the Jays are going to be forced to carry three catchers, something that isn’t at all desirable. It also may lead to AA gearing up his quest to trade Navarro, though I think that is unlikely unless Navarro becomes unhappy to the point that it’s a problem for the team. From everything we’ve seen from him in the past year, I don’t think that’s going to happen. The three headed monster of Maicer Izturis/Munenori Kawasaki/Ryan Goins is set to divvy up playing time at second base, with an outside chance of prospect Devon Travis cracking the lineup at some point during the summer. Izturis is the highest paid of the three, meaning the job is probably his to lose at this point. However, I think his grasp on the spot is tenuous at best, and a good camp from Goins could lead to him earning another shot. He won the job out of spring training last year, but quickly floundered at the plate. Even if Izturis keeps the job, Goins glove and positional flexibility (he also plays an excellent shortstop) could keep him on the big club. Kawasaki is likely destined for Buffalo, but we’ll see him once or twice before the season is over – of that I’m sure. Regardless, unless Travis explodes, it doesn’t seem like a long term answer at second exists among these current Jays. ‘This guy right over here! The one who can’t grow a beard. Yeah, he’s a big key to our season’ Thanks Marcus! When you have a strong top four, the fifth starter isn’t generally a huge question. When your top four consists of two geriatrics (albeit consistent ones) and two 24 year old arms, the question looms a bit larger. When that fifth starter is as hot a young prospect as Aaron Sanchez or Daniel Norris (at least among Jays nerds), the buzz around the competition for the job is probably the most fun conversation in camp. 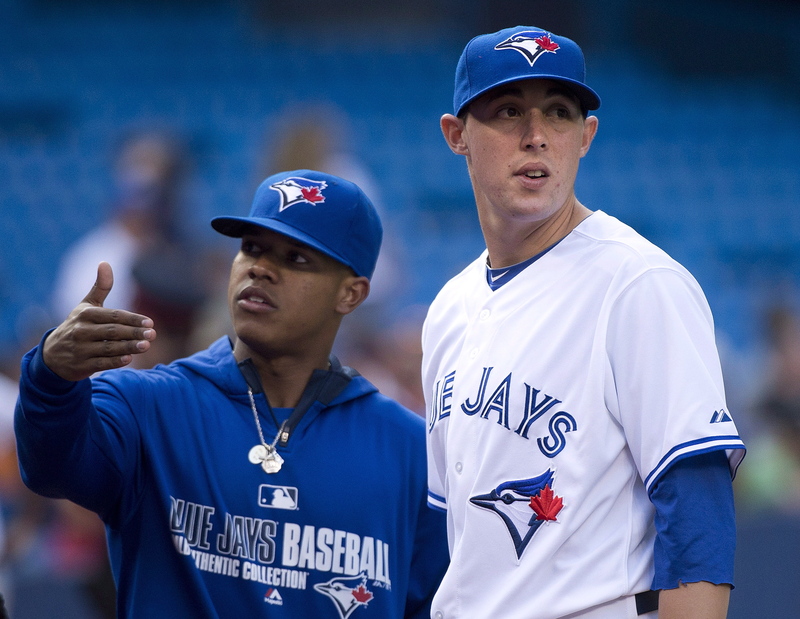 The Jays got a huge boost from Marcus Stroman and Drew Hutchison last season. Adding another young arm to the staff can only help a club that also has prospects Jeff Hoffman and Roberto Osuna rising through the ranks. But like I said before, it’s not just about the roster, it’s about the roles. The fifth starter race will also answer any other questions that surround the current Jays pitching staff in terms of role. Scenario 1: Aaron Sanchez wins the job. Daniel Norris begins the year in Triple A Buffalo, with the opportunity to spot start later in the season or join the bullpen down the stretch. Marco Estrada moves to the bullpen, probably as the long man, meaning Todd Redmond will be pushed back into more high leverage situations. Steve Delabar will be relied on to regain his 2013 form, or a move for bullpen help with definitely be necessary. Brett Cecil is the likely closer, with Aaron Loup and Delabar as his set-up men. Scenario 2: Daniel Norris wins the job with a fantastic camp. Sanchez is moved to the back end of the bullpen, with the opportunity to close. Estrada again moves to the bullpen as the long man. Redmond and Loup fill the role of righty-lefty relievers, with Cecil and Delabar as the lefty/righty set-up men. Cecil likely gets an equal chance to close, along with Sanchez. Scenario 3: Norris isn’t ready and Sanchez struggles as a starter. Marco Estrada is placed in the fifth starter role in a holding pattern, until Norris gets some seasoning at Triple A Buffalo. Redmond is the long man in the bullpen and Sanchez is once again given the opportunity to co-close, along with Cecil, until one of them seizes the job. Steve Delabar and Aaron Loup are leaned on heavily as set-up/late inning guys. It’s really only going to be one of those three, at least to start. I’ve only mentioned Cecil, Delabar, Redmond, Loup and Sanchez/Estrada as sure things for the ‘pen, meaning there are two or so other spots to fill. A return to excellence for Delabar is by no means a sure thing either, so there could be more than two. Chad Jenkins, Rob Rasmussen and even Kyle Drabek are organizational arms with a chance to grab those spots, but non-roster invitees like Luis Perez and Tiago ‘Shogun’ da Silva also have a chance to make the roster. Prospect Miguel Castro is another name that has been mentioned, cranking necks around with his fast development. Right now the Jays seem to see more value in him as a starter. He’s hit 99 on the gun and could be a big league reliever right now, but needs to develop a breaking ball if he wants to start in the big leagues. He’s not likely to break camp with Toronto, but could potentially be a fun September call-up, if depth is needed. As always with baseball, hope is eternal in spring. For this years incarnation of the Jays, that hope is attached to the stars in their top heavy lineup and the youth that hopes to buoy their roster during the upcoming season. If Pompey, Sanchez and Norris can follow in the footsteps of Stroman and Hutchison last season, the future looks bright.